By Spider Rybaak Oswego County, NY -- October sets the state&apos;s regular deer hunting season into motion. Boasting opening day of the northern zone, it gives average hunters their first chance to go out and drop a deer. For guys who prefer the relative comfort of the state&apos;s more cultivated region, it gets them psyched-up for the southern zone&apos;s opener next month. Whichever you prefer, Oswego County is split almost equally between the two, offering the best of both zones. In fact, hunters in Oswego County harvested 2,349 bucks and 4,347 antlerless deer during the 2008 season, a 27 percent increase over the previous season, according to the New York State Department of Environmental Conservation&apos;s annual deer harvest report. The shooting started on the northern zone&apos;s opener, Saturday, Oct. 24. Covering the vast majority of the county&apos;s lightly developed eastern half, downwind of Lake Ontario, Oswego County&apos;s part of the zone claims some of the state&apos;s harshest winter conditions, turning them into the most challenging wilderness hunting this side of the Adirondack Park. Largely set in the Tug Hill Plateau, and the only slightly less inhospitable areas on its southern rim, this heavily forested region is known for lake effect snow and gets some of the heaviest snowfall in the country, a factor that takes a heavy toll on the deer herd. In fact, Wildlife Management Unit 6N, one of the only WMUs that doesn&apos;t issue Deer Management Permits allowing the taking of does, is located here. Still, last year hunters averaged two bucks per square mile in this 491 square mile unit which includes most of the Littlejohn Wildlife Management Area. Considering it takes a large deer to survive up here, the bucks that are taken are above average. If you&apos;re into wilderness-like hunting but want to enhance your chances of scoring, Daryl Jenks, senior wildlife biologist with the state Department of Environmental Conservation, suggests you try Happy Valley WMA. "There&apos;s more timber sale activity so you have more early successional growth; fields and open areas which provide browse." Other public lands open to hunting in Oswego County&apos;s piece of the northern zone include Winona, Battlehill, Chateaugay, Trout Brook, Sandy Creek, Kasoag, Stone Hill, West Osceola and Klondike State Forests, and Deer Creek and Hall Island State WMAs. Southern Zone Blessed with much milder weather, only about half the snowfall, and most of the farmland, Oswego County&apos;s southern zone is much more deer-friendly. Much of the land is in private hands but there is a large public holding available for your hunting pleasure: Three Mile Bay/Big Bay WMA. Located on the north shore of Oneida Lake, "it includes a lot of swamp and marsh, making for some pretty heavy sloggin&apos; in some parts," says Jenks. Bordered by Oneida Lake to the south, a golf course to the north, farms and backyards just about everywhere else, this WMA packs a lot of deer into its 3,615 acres. Being so close to civilization it also offers parking areas with easy access off Toad Harbor and West Roads, McCloud and Shaw Drives. Generally, Oswego County residents are a conservative lot. Asking a landlord for permission to hunt his property is a tradition in these parts. So if you see a spot that looks like it&apos;s harboring the buck you want hanging on your wall, give the owner a call or a knock on the door and ask. A map showing the locations of Oswego County&apos;s State Forests and WMAs is featured on pages 16 and 17 of the "Oswego County Hunting and Fishing Guide." 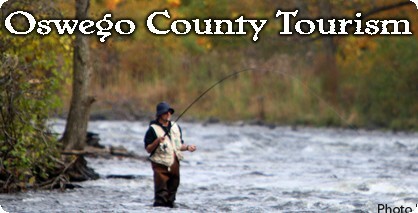 To download it, go to www.visitoswegocounty.com To request a hard copy, call 800-248-4386 or email tourism@oswegocounty.com. Spider Rybaak is an award-winning outdoor writer who has been published in more than 20 periodicals. He is the author of "Fishing Eastern New York" and "Fishing Western New York" guide books that cover 429 streams and lakes in New York State. 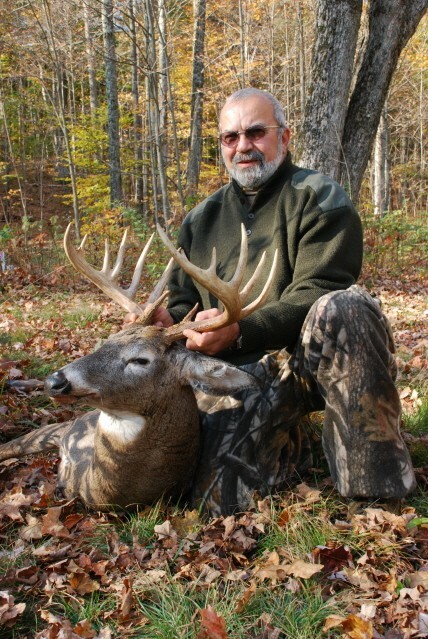 Contact him at srybaak@yahoo.com Check out his blog at http://fishingandhuntinginoswego.blogspot.com/ Photo caption Mike Lavenia shot this 15-point buck last fall in Redfield, in the Northern Zone. Photo courtesy of Lake Ontario Outdoors.